Preview card for Sonia Boyce | Like Love: Parts One & Two. The exhibition ran from 30 January - 28 March 2010 and the opening took place on Friday 29 January 2010, 6 - 8 pm. The exhibition itself consisted of two installations. Part Two consisted of: “An installation made in collaboration with Blue Room, an arts service for learning disabled adults based at the Bluecoat in partnership with Liverpool City Council.” Consisted of a series of inkjet prints mounted onto aluminium and looped DVDs, involving individuals and a group of people with whom Boyce worked, in 2010. The other side of the card was an announcement for an exhibition titled Action, curated by Sonia Boyce and running concurrently with Sonia Boyce | Like Love: Parts One & Two. Action featured the work of Beverley Bennett, Appau Boayke-Yiadom, Robin Deacon, and Grace Ndiritu. 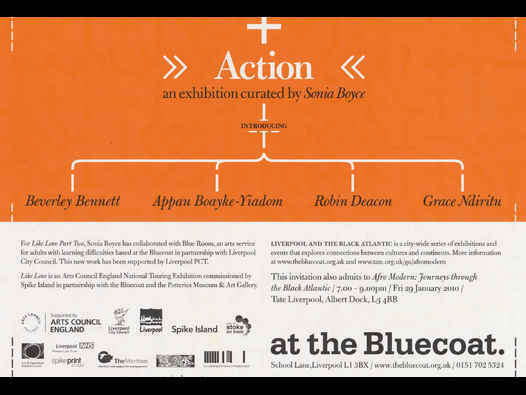 Exhibited concurrently with Sonia Boyce’s Like Love Parts One & Two, Action was at the Bluecoat, 30/1/10 - 28/3/10. Curated by Boyce, the publicity for the exhibition claimed that Action and Boyce were ‘introducing’ a number of artists, though one of the four artists selected, Grace Ndiritu was by this time an accomplished and widely exhibited artist. The others in the Action exhibition were Beverley Bennett, Appau Boayke-Yiadom, and Robin Deacon. Each of the artists had his/her own section of the gallery, presenting, as it were, four solo exhibitions. The exhibition marked an important opportunity for a number of the artists. 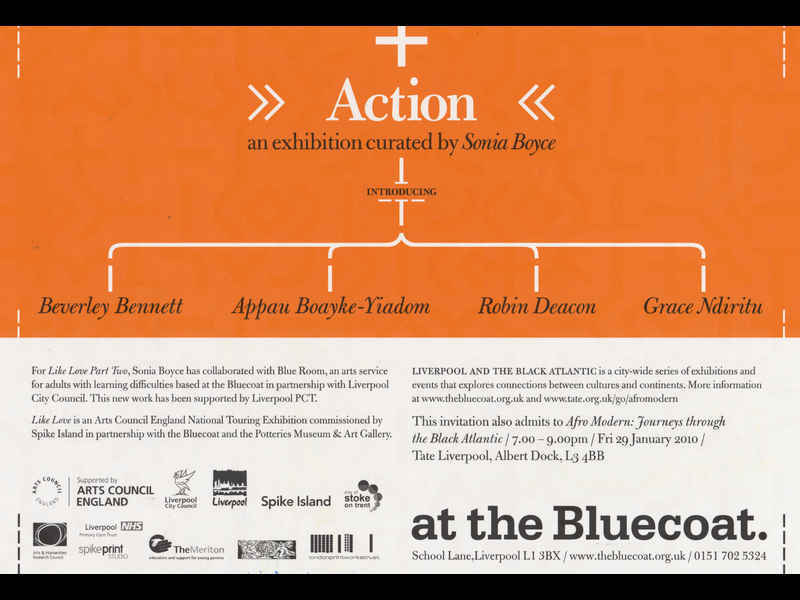 Preview card for Action, an exhibition curated by Sonia Boyce. The exhibition ran from 30 January - 28 March 2010 and the opening took place on Friday 29 January 2010, 6 - 8 pm. Action featured the work of Beverley Bennett, Appau Boayke-Yiadom, Robin Deacon, and Grace Ndiritu. This publicity for the exhibition claimed that it (the exhibition) and Boyce were ‘introducing’ a number of artists, though Ndiritu was by this time an accomplished and widely exhibited artist. 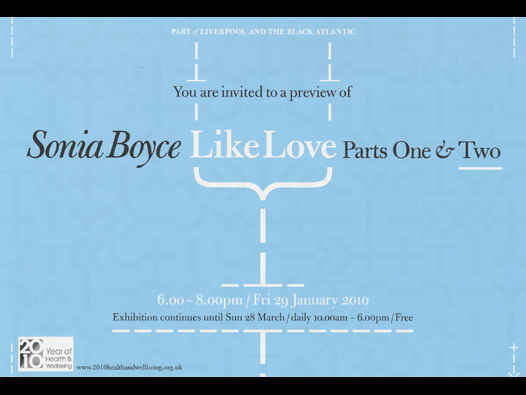 The other side of the card was an announcement/invitation card for Sonia Boyce | Like Love: Parts One & Two, which ran concurrently with Action.